You are currently browsing the Carpe DMM blog archives for April, 2011. I fly out for Ecuador (via New Zealand and Chile) first thing in the morning, so this is the last time I’ll be using the Internet until 6 May. From the Galapagos Islands I’ll be travelling south through Peru until I reach Santiago, Chile, before heading home again. See you all when I get back! 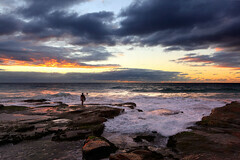 I got up at 4:30 on Friday morning to go out to Curl Curl Beach and take some photos of the sunrise. It’s the nicest time of year to do this, and it will probably be my last chance before leaving for South America. The sunrise wasn’t great, but I got some half decent shots. It was pitch black when I got to the beach, but there were already some people swimming in the rock pool at the southern end. By the time the sun came up, it was like rush hour – dozens of people in the pool, lots of surfers out, a fisher collecting bait on the rocks, several joggers, an entire fitness class being put through a routine with a trainer, and a guy on the beach doing a painting! It would be so nice to live by the beach and get up before dawn every day! Friday was also Magic night – we played a 5-player round robin draft of the latest two sets: Scars of Mirrodin and Mirrodin Besieged. Alas, I lost every game! And I thought my deck was pretty good when I was assembling it too. Oh well, my excuse is I was too tired! I was amazed while watching “By Any Other Name” that I didn’t really remember anything about the story unfolding before me. I was racking my brain trying to think how the episode resolved, but couldn’t recall it. And then, 5 minutes before the end, I realised why, when my DVD glitched and refused to play any more. Then I remembered, this happened the first few times I tried to watch this episode on DVD as well – my disk is clearly borked in that spot. Undaunted, I found a copy of the video online and watched the last 5 minutes so I could complete this review. And it’s a shame I hadn’t been able to watch it to completion on DVD before, because it’s a pretty good episode. It begins with the Enterprise answering a distress call and Kirk, Spock, McCoy, redshirted security officer Shea, and pretty young Yeoman Thompson beaming down to a planet to investigate. They are met by Rojan and Kelinda, who soon reveal themselves to be Kelvans from the Andromeda Galaxy, equipped with paralysis field devices that can stop people motionless. Kelinda is also equipped with a full-back-revealing costume that attracts Kirk’s eye. They also demonstrate the ability to turn people into fist-sized dehydrated cuboctahedrons, which can either be reconstituted into an unharmed person, or crushed, thus killing the person. They demonstrate this on Shea and Thompson, and you just know that black guy Shea will be the one they’ve killed, but when the remaining solid is reconstituted, Shea reappears, meaning that the luckless Yeoman Thompson has been the victim. Rojan, Kelinda, and their handful of associates capture the landing party. Spock attempts an escape by reusing a trick that Kirk says he used on Eminiar 7 – a reference to the episode “A Taste of Armageddon“. But this time the attempted mind control on Kelinda backfires and Spock is temporarily incapacitated. Later, Kirk asks Spock to use his self-trance ability to feign illness so he and McCoy can beam back to the Enterprise on the pretence of treating Spock. This is pulled out of thin air, as we’ve never previously seen Spock demonstrate such an ability, and frankly they could have avoided it easily because soon after the Kelvans return everyone to the ship which they take over and start heading to Andromeda. Their plan is to report back that our Galaxy is prime for invasion, after 300 years in transit in which only their descendants will arrive. The rest of the story is about how Kirk and crew solve the problem of dealing with uberpowerful aliens. Scotty sets up a self-destruct to destroy the ship, and any threat of invasion, but Kirk opts for a third option. The breakthrough comes when Spock realises they are higher beings, taking human form only for convenience, meaning they are unused to human sensory inputs. They notice this when one Kelvan expresses first disdain at the primary coloured food cubes they are eating, claiming food pills are better, then delight when he actually tastes them. McCoy starts injecting this Kelvan with stimulants, claiming he needs vitamins, while Scotty starts getting another one drunk. Kirk turns his attention to Kelinda, seducing her in the line of duty, while Spock discusses this development with Rojan and points out that Rojan is getting jealous. Kelinda is initially bluntly straightforward: “Oh, you are trying to seduce me,” but then starts to enjoy it. Spock’s discussion with Rojan takes place over a game of 3D chess, in which we also see in the rec room the 3D checkers set, and a deck of circular playing cards (see above picture). Rojan and Kirk have a confrontation over Kelinda, resulting in a fight, in which Kirk restrains Rojan, then suggests that Rojan is now more human then Kelvan. Kirk says the Kelvans would hardly recognise Rojan’s people now, and that his mission was to find somewhere for Kelvans to live. Kirk suggests the Kelvans could work with the Federation and plenty of empty planets could be found for them. They agree to send a robotic probe to Andromeda rather than take the Enterprise there, and the episode ends in a chummy new-found friendship after Kelinda declares she wants Rojan, not Kirk. It’s a bit if an abrupt ending, with most of the Enterprise crew still dehydrated into cuboctahedrons (we saw one on Uhura’s chair earlier), but presumably that will be remedied before the next episode. Overall, a pretty satisfying episode, with plenty of action, drama, romance, comedy (Scotty and the drunk Kelvan), and mystery over how the good guys can possibly prevail in the end. Tropes: Literary Allusion Title, Theiss Titillation Theory, Taken For Granite, Instant People, Just Add Water, Literally Shattered Lives, Black Dude Dies First (shockingly averted), Men Are The Expendable Gender (also shockingly averted), New Powers As The Plot Demands, All Your Base Are Belong To Us, Generation Ships, Self Destruct Mechanism, Take A Third Option, The Mind Is A Plaything Of The Body, Food Pills, Drinking Contest, What Is This Thing You Call Love?. Body count: Yeoman Thompson (dehydrated into a cuboctahedron and crushed).